Who deserves what in racing? Some answers are obvious. Marc Marquez deserves all the support and success he enjoys. Valentino Rossi deserves all the adulation. World champions of every hue deserve to make enough money to retire comfortably. And every one of them, every rider fast enough to even qualify for a GP, deserves the fullest respect. What Cal Crutchlow didn’t deserve was such bad ankle injuries in the Australian GP that he will almost certainly lose out on his excellent fifth overall in the championship, and also the position of top Independent Team rider. Nor did he deserve the painful surgery and lengthy rehabilitation that will follow. And you could say the same thing about pretty much any rider who gets hurt while racing. Though to be honest there are some who often seem to be looking for trouble. But deserving has nothing to do with it. What does determine one’s fate, in that awful moment after your tires have let go of the tarmac and there’s that dread sound of the fairing skitter-scraping across the road, is blind luck. In Cal’s case, very bad luck. Several other riders crashed at Phillip Island’s ultra-fast Turn One, none more spectacularly than Johann Zarco, after tagging Marquez’s back wheel. This hurled his bike into a reverse ground-loop and the rider across the grass at not very far short of 200 mph. That was blind luck again. On the grass, he slid more than he rolled. If, like Cal, he’d hit the gravel, he’d have gone end over end, and would have been in line for some very serious injuries. The same goes for Marquez. His seat unit was broken loose, and his rear tire slashed in the encounter. Yet he merely wobbled, said later that he’d thought he might high-side, but obviously didn’t. And rode safely back to his pit. More luck? How about Andrea Iannone, right behind Zarco and sucked along in his slipstream as he strove to make up for his Suzuki’s relative lack of speed. Zarco’s bike came within inches of ending up under his wheels. By these margins, MotoGP got away with it. Just. Zarco walked away from it. As did Hafizh Syahrin, Steven Odendaal and a couple of others, having beaten the odds at the dreaded Doohan Corner. Only Cal was badly hurt. This is a tribute to modern safety equipment. But while I guess he should be thankful that he didn’t bang his head or worse, not all the super boots, back protectors, kangaroo-hide tailoring and in-leather airbags were able to prevent Cal’s nasty leg injuries. 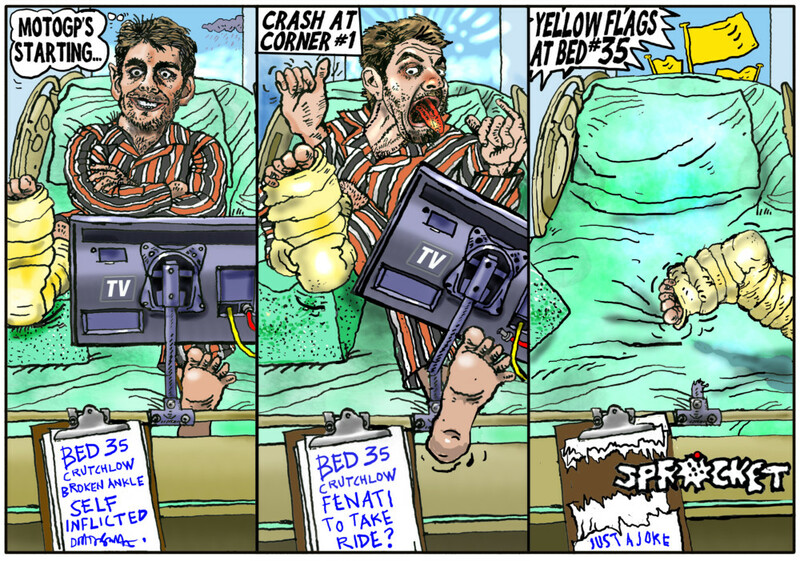 Crutchlow, a self-confessed crasher, has had quite a few this year. To be exact, 17. But that’s not the most in the premier class. Alvaro Bautista has clocked up 19; Marquez still leads the field on 20, with nothing worse than a bit of grit in his eye at Misano. To be fair, most of Marquez’s prangs are innocuous low-side slip-offs, losing the front while—as is his habit—he seeks the limit during free practice. As often as not he saves it, and since he already has knee and elbow on the deck, he doesn’t have far to fall. But they’re not all like that, and his ability to bounce means Crutchlow nicknames him The Cat. Because he always lands on his feet. As a matter of interest, the safest MotoGP rider is Australian GP winner Maverick Vinales, with just two tumbles this year. Dovizioso and Petrucci come next on four apiece. Clearly they don’t subscribe to the Marquez theory, that the best way to find exactly where the limit lies is to go over it. Nor do they have as many race wins and championship points as him. Nobody would suggest, however, as his approach would seem to imply, that crashing is compulsory. There is truth in the old adage: that it is easier for a fast but crash-happy rider to learn how to stop crashing than for a safe, slow rider to learn how to go fast. But there is also the question of survival. But while luck is blind, you can push it too far. Also eliminated from Sunday’s race was manic Moto2 rider Stefano Manzi. The Saturday fall that hurt his wrist was his 31st this year. Even outranking the unenviable tally of 30 put up by Sam Lowes back over a full season in 2016. What does it mean? That part of the excitement of motorcycle racing is that the danger is real, and part of the pleasure is when riders get away with it. As many times as they can. Be crash-happy by all means, as long as it does end happily.